With Easter just a few weeks away, your mind might be focused on all things Easter baskets, but make sure you don’t forget to think about something for your Easter dinner host. But, hey, why not make a little something for yourself while you’re at it?! I’ve teamed up with Ball Mason Jars and Michaels to show you how to create DIY Mason Jar Easter Fairy Garden Terrariums using the fun special edition anniversary jars that are replicas of a 100-year-old design! This year we are headed to my parents for Easter and I don’t want to arrive empty handed, but I also still love decorating the house a little, even if we won’t be here Easter weekend. So, forget BOGO (buy one, get one) and try MOGO, make one, give one! By making two jars, I get to give one away and keep one for myself! I’ve always loved using jars for all kinds of fun crafts, so although I received free products as a part of this partnership, all of my opinions and recommendations are my own. I never recommend brands or products I don’t love! This post also contains affiliate links, which means we may receive a commission if you click a link and purchase something that we have recommended. While clicking these links won't cost you any extra money, they will help us keep this site up and running! Once I had my crafty vision, I headed to Michaels. It was the perfect one-stop shop for all of the fairy garden terrarium supplies I needed. I had fun browsing a full aisle of Spring and Easter tiny treasures. When I went to grab my supplies, the whole collection was 50% off, so keep a lookout for sales or make sure to bring your Michaels coupon. This project makes for a fun group activity, too. It’s easy to display the supplies in a dough bowl or other serving dishes, so everyone can quickly grab the supplies they need while creating their unique fairy garden jar. The best part? It can keep Easter guests of all ages entertained while the ham is in the oven! Unscrew your quart sized mason jar. This unique anniversary edition jar is only available at Michaels and can be used for so many projects or you can serve your favorite Easter brunch drink in them as well! To get started on your garden, first add a layer of the rock to jar. If you have a larger item like a tree, nest that in the rock layer for stability. Next, start adding in a layer of moss. I picked up a multi-colored variety pack filled with a variety of styles and textures. The moss was the most expensive item on the supply list, but you can always use a Michael’s coupon to save a few dollars. The good news is, a lot goes a long way and I still have a bunch left over for future projects. Even if you do the project with a group of friends or family, one bag should be plenty for everyone to share. Be sure to mix the different types of moss to create that eclectic feel. You may want to use some tongs or a popsicle stick to manipulate the placement of the moss. You can add in additional rock if you’d like, otherwise you are ready to start adding in figurines. 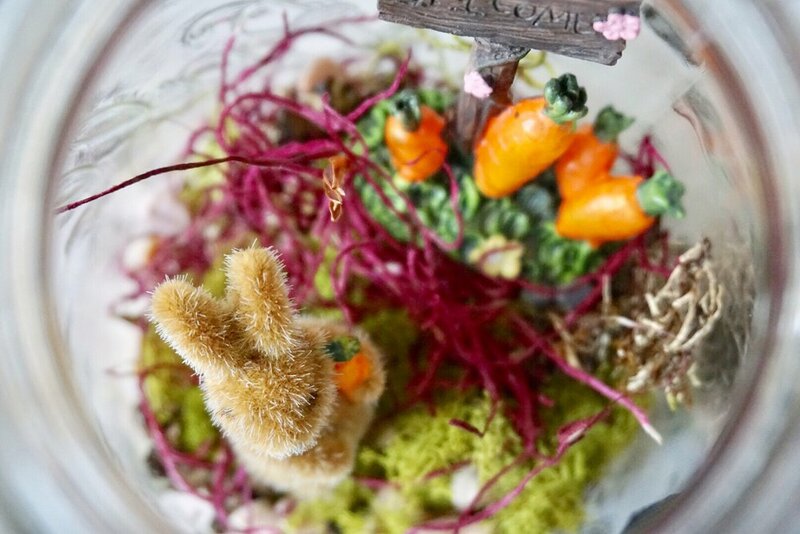 To add a festive twist to these fairy gardens, I decided to keep them Easter themed. Michaels had a ton of different figurine options. I settled on a farmer bunny boy that paired perfectly with some flowers in a pail and another pot of flowers. For the other jar, I chose a flocked bunny with a carrot and paired it up with a carrot welcome sign. If bunnies aren’t your jam, they had chicks, deer, and more cute Spring signage. You can always go the traditional fairy route, too! Add in any additional moss until you feel your garden is complete! The great part about this project is that there’s no one right way to make it. Part of the beauty is all of the items mixed together. Screw back on the lid and your done! I can’t wait to give one of these to my Mom! I know she’ll appreciate getting a homemade gift from me!